Advisory Committee Meetings are held monthly at City Hall Chambers at 7875 Moffett Road, Semmes, Alabama 36575 at the specified times on the chart below. with the name of the Advisory Committee, you are interested in. 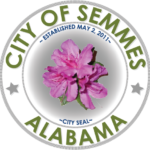 The Mayor of the City of Semmes has established “Advisory Committees” composed of Council Members and individuals from the Semmes Community (both within the City Limits as well as the Jurisdictional Limits). These Advisory Committees function as a “working” arm of the City Council. Advisory Committees enable Council Members to split the workload and concentrate their efforts toward improving specific areas. Advisory Committees may be dissolved or new ones created as needed. Advisory Committees are a structured way for individual citizens to share their opinions and perspectives, study issues, and develop recommendations in a focused, small group structure. The primary purpose for Advisory Committees to have membership from citizens in the Community is to provide advice and input, from a citizen perspective to the City Council. The principal job of an Advisory Committee lies in the investigation, study, and evaluation of that segment of the municipal operation assigned to it. Committees report recommendations to the Mayor and City Council usually with a Project Request Form (PRF). It should be emphasized that memberships on an Advisory Committee does not carry any administrative powers. The Advisory Committee cannot implement their recommendations without formal approval from the Mayor/City Council. All expenditure of funds as well as legislative decisions is only made by the Mayor/City Council (by Ordinance or Resolution) prior to implementation. These committees should discuss, formulate and transmit well-developed, thoughtful recommendations to the Mayor and City Council in a timely manner. Specific goals/projects are assigned to each Advisory Committee by the Mayor based on the current and future needs of the Community. These goals/projects are developed based on perspectives and advice from the City Council, key issues, public comments received at Council Meetings, town hall type meetings, emails, personal contacts, and letters, or just the general recognized a need. Goals/Projects may be amended or modified, escalated in priority, new ones created or even some removed from the Advisory Committee Charters by the Mayor as necessary. Advisory Committees should develop work plans for the specific goals/projects assigned – in developing these work plans, the committees should consider. Please make sure that all cell phones are turned off or are on silent to avoid any unnecessary interruptions in the meeting. Any person desiring to address the COMMITTEE must register and complete the form upon entering the meeting area. Please give the completed form to the RECORDING SECRETARY prior to the meeting being called to order. Public Comments are ONLY allowed during the Public Comment portion of the meeting. When addressing the COMMITTEE, the speaker must state his/her name and address. Each speaker is allowed three minutes to address the COMMITTEE. A bell will sound to indicate the end of 2 minutes. One minute is allowed for summarizing. The second bell indicates the time has expired. When addressing the COMMITTEE, there is to be no personal address to any individual Committee member. All statements are to be made to the Chair who will recognize any Committee member who wishes to respond. To maintain the decorum of the meeting, there will be no undue applause and/or public outcry allowed. This is a meeting of the COMMITTEE Members and not an open public forum.